With over 100 years of carpet sales and installation experience, we depend on our experience to ensure your total satisfaction. We do not subcontract any of our installation services. 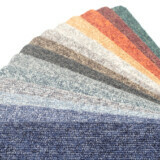 We use our experts to install your new carpet, giving you peace of mind and a quality installation. We have access to any carpet style and color you are looking for and regularly sell Royalty, Camelot and Shaw brand carpets. If you are looking for a great value and quality service, look no further. We look forward to installing your new carpet! Call 916-455-3081 for a FREE estimate.